I've never watched it but definitely will if GB is on it! Yeah, I can make my eyes go big and say "What was that?" Hey, so could I...for some coin! might even throw in a couple fockers if the price is right. I was just thinking the scotch got to you and you forgot where you were...if it was one of the other guys I'd just chalk it up to old age. To Whom am I kiddin' I'd cuss fer free. an informative post ... The average person cannot identify an owl call if it was right above them. My house is surrounded by 75+ feet of pines. Years ago there was one right above the master bedroom. We used to have the windows open at night, and then this happened. The first time I heard it I thought it was a girl that lost an arm as I had no idea. i had to give the cats a bath yesterday. i'm surprised no one called the police. sounded like i was torturing someone. yup, they sound like babies crying. So, after you removed the cats' claws from your skin, what did you do next ? first i clip their nails, and then i change into sweatpants and a long sleeved sweatshirt. i learned my lesson the hard way years ago. maybe its just me, but every time i see the "official" big foot thread in the "real hiking" forum i think i've been transported to another website which claims to be about hiking. Perhaps should be relocated to Coffee Talk (or what ever that is). Great example of the importance of experience and understanding sequencing of events. we had a squatch kill two lesbians in michigan the other day. I don't know if it was a hate crime or not. Diva, one of the producers for Finding BigFoot Told me that there weren't enough people in FL that wanted to share their story so the team decided they were going to Arkansas instead. they gonna talk to bill? Bill has not lived here in over 20 years. I have a fond memory of seeing the movie/documentary "the legend of boggy creek" with my pop back in 73' in an old theater that just reopened after years of being shut down and with a face lift an poofy chairs. Having old family roots in Texarkana and Arkansas, I'm particularly fond of this story. The post was edited 1 time, last by Socks ( Dec 1st 2015, 6:48am ). My 18 year old kid got called an "ignorant redneck" by his 7 year old little cousin at the Thanksgiving dinner because he told the 7 year old that "squatches were real", lol! The post was edited 1 time, last by Foresight ( Dec 1st 2015, 6:55am ). My 18 year old kid got called an "ignorant redneck" my his 7 year old little cousin at the Thanksgiving dinner because he told the 7 year old that "squatches were real", lol! Well I hope he kicked him in the shin...under the table o'coarse. He hung him from a tree in the yard by his belt, lol. we got the dogman in Michigan. 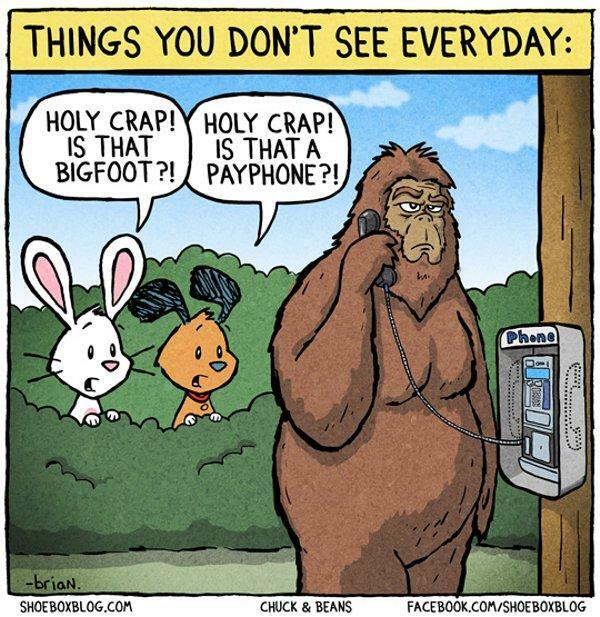 I always thought bigfoot was a Masshole. I wonder how old Grey Blazer is doing? It must be all that radioactive waste Homer Simpson brings home from work in Springfield. Bigfoot road crossing reported S of Blairsville last Friday. A very nice retired couple called yesterday to report they clearly observed a brown Sasquatch lumber across Hwy 129(almost to 180) on their way home from Gainesville at 12:30am. The husband said it was only 50’ ahead of them, and they both saw it in their headlights. They got a very clear look at it as it stepped across Hwy, glanced back at them, before stepping down the embankment. They were non-believers before, but were “freaked out” when they saw one for themselves....thank you for the report. this is about 3 miles N of mountain crossings at neels gap on the road (19/129) that the store is on. The post was edited 1 time, last by max.patch ( Jan 25th 2019, 1:39pm ). Doesn't Big Foot have a new movie out? Could be a promotion, but I have to agree with Mr. Jam. Nobos are very furry this time of year. that's a heavy growth for a NOBO on day 4 (most hikers).